เมื่อวันที่ 5 ธันวาคม พ.ศ. 2554 เอสแอนด์พีกำหนดระดับความน่าเชื่อถือของประเทศระยะยาวแก่ 15 สมาชิกยูโรโซนไว้ที่ "เฝ้ามองความน่าเชื่อถือ" (CreditWatch) โดยแสดงเจตนาลดระดับ เอสแอนด์พีเขียนเช่นนี้เนื่องจาก "ความเครียดเกี่ยวกับระบบจากห้าปัจจัยที่สัมพันธ์กัน ได้แก่ 1) สภาวะการปล่อยสินเชื่อที่รัดกุมขึ้นทั่วยูโรโซน, 2) ส่วนชดเชยความเสี่ยง (risk premium) ที่สูงขึ้นอย่างเห็นได้ชัดต่อประเทศยูโรโซนจำนวนเพิ่มมากขึ้น รวมทั้งบางประเทศที่ปัจจุบันถูกจัดให้อยู่ในระดับ "AAA", 3) ความไม่ลงรอยกันต่อเนื่องในหมู่ผู้วางนโยบายยุโรปว่าจะรับมือกับวิกฤตความเชื่อมั่นของตลาดฉับพลันอย่างไร และ ในระยะยาว ว่าจะประกันการบรรจบกันทางเศรษฐกิจ การเงินและภาษีที่ดีกว่าในบรรดาสมาชิกยูโรโซนอย่างไร, 4) ระดับความเป็นนี้ภาครัฐและครัวเรือนที่สูงทัวพื้นที่ยูโรโซนอันกว้างใหญ่, และ 5) ความเสี่ยงการถดถอยทางเศรษฐกิจที่สูงขึ้นในยูโรโซนโดยรวมใน พ.ศ. 2555 ขณะนี้ เราคาดหวังว่าปริมาณการผลิตจะลดลงปีหน้าในประเทศอย่างสเปน โปรตุเกสและกรีซ แต่ปัจจุบันเรากำหนดความเป็นไปได้ 40% ที่ปริมาณการผลิตจะลดลงในยูโรโซนทั้งหมด"
↑ Long-term interest rate "Long-term interest rate statistics for EU Member States" Check |url= value (help). ECB. 12 July 2011. สืบค้นเมื่อ 22 July 2011. ↑ Wearden, Graeme (20 September 2011). "EU debt crisis: Italy hit with rating downgrade". The Guardian. UK. สืบค้นเมื่อ 20 September 2011. ↑ Heard on Fresh Air from WHYY (2011-10-04). "NPR-Michael Lewis-How the Financial Crisis Created a New Third World-October 2011". Npr.org. สืบค้นเมื่อ 2012-07-07. ↑ Koba, Mark (2012-06-13). "CNBC-Europe's Economic Crisis-What You Need to Know-Mark Thoma-June 13, 2012". Finance.yahoo.com. Archived from the original on 2012-12-17. สืบค้นเมื่อ 2012-07-07. ↑ George Matlock (16 February 2010). "Peripheral euro zone government bond spreads widen". Reuters. สืบค้นเมื่อ 28 April 2010. ↑ "Acropolis now". The Economist. 29 April 2010. สืบค้นเมื่อ 22 June 2011. ↑ Bruce Walker (9 April 2010). "Greek Debt Crisis Worsens". The New American. สืบค้นเมื่อ 28 April 2010. ↑ "Greek/German bond yield spread more than 1,000 bps". Financialmirror.com. 28 April 2010. สืบค้นเมื่อ 5 May 2010. ↑ "Gilt yields rise amid UK debt concerns". Financial Times. 18 February 2010. สืบค้นเมื่อ 15 April 2011. ↑ "How the Euro Became Europe's Greatest Threat," Der Spiegel, 20 June 2011. ↑ "Greek debt crisis: eurozone ministers meet amid deepening gloom," The Guardian, 19 June 2011. ↑ "Athens protests: Syntagma Square on frontline of European austerity protests," The Guardian, 19 June 2011. ↑ "Britain's deficit third worst in the world, table". The Daily Telegraph. London. 19 February 2010. สืบค้นเมื่อ 29 April 2010. ↑ "Fiscal Deficit and Unemployment Rate, FT". สืบค้นเมื่อ 5 May 2010. ↑ "Timeline: Greece's economic crisis". Reuters. 3 February 2010. สืบค้นเมื่อ 29 April 2010. ↑ "EU ministers offer 750bn-euro plan to support currency". BBC News. 10 May 2010. สืบค้นเมื่อ 11 May 2010. ↑ Gabi Thesing and Flavia Krause-Jackson (3 May 2010). "Greece Gets $146 Billion Rescue in EU, IMF Package". Bloomberg. สืบค้นเมื่อ 10 May 2010. ↑ Sarah Butler (11 April 2011). "Portugal prepares to meet EU and IMF to negotiate bail-out". The Daily Telegraph. UK. สืบค้นเมื่อ 18 April 2011. ↑ Pidd, Helen (2011-12-02). "Angela Merkel vows to create 'fiscal union' across eurozone". London: Guardian. สืบค้นเมื่อ 2011-12-02. ↑ "European fiscal union: what the experts say". London: Guardian. 2011-12-02. สืบค้นเมื่อ 2011-12-02. ↑ "How the Euro Became Europe's Greatest Threat". Der Spiegel. 20 June 2011. ↑ "Euro Stable Despite Debt Crisis Says Schaeuble". The Wall Street Journal. 22 August 2011. ↑ "Puzzle over euro's "mysterious" stability". Reuters. 15 November 2011. ↑ "The Euro's PIG-Headed Masters". Project Syndicate. 3 June 2011. ↑ 33.0 33.1 33.2 Lewis, Michael (2011). Boomerang – Travels in the New Third World. Norton. ISBN 978-0-393-08181-7. ↑ "Merkel Slams Euro Speculation, Warns of 'Resentment' (Update 1)". BusinessWeek. 23 February 2010. สืบค้นเมื่อ 28 April 2010. ↑ Laurence Knight (22 December 2010). "Europe's Eastern Periphery". BBC. สืบค้นเมื่อ 17 May 2011. ↑ "PIIGS Definition". investopedia.com. สืบค้นเมื่อ 17 May 2011. ↑ Bernd Riegert. "Europe's next bankruptcy candidates?". dw-world.com. สืบค้นเมื่อ 17 May 2011. ↑ Manolopoulos, J. Greece's 'Odious' Debt: The Looting of the Hellenic Republic by the Euro, the Political Elite and the Investment Community. London, May 2011: Anthem Press. ↑ "Eurozone Problems". New York Times. 2012-01-30. สืบค้นเมื่อ 2012-02-04. 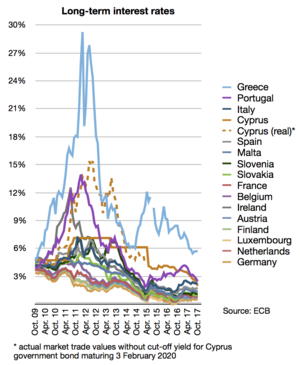 ↑ 50.0 50.1 "State of the Union: Can the euro zone survive its debt crisis? (p.4)" (PDF). Economist Intelligence Unit. 2011-03-01. สืบค้นเมื่อ 2011-12-01. ↑ Martin Wolf (2011-12-06). "Merkozy failed to save the eurozone". The Financial Times. สืบค้นเมื่อ 2011-12-09. ↑ 52.0 52.1 "COMMERCIAL TRANSACTIONS OF GREECE (Estimations) : October 2011" (PDF). Hellenic Statistical Authority. www.statistics.gr. 9 December 2011. สืบค้นเมื่อ 8 December 2011. ↑ Inman, Phillip (2012-01-03). "If surpluses cause as many problems as debts, maybe we need to tax creditors". The Guardian. UK. สืบค้นเมื่อ 2012-01-03. ↑ Liz Alderman; Susanne Craig (November 10, 2011). "Europe's Banks Turned to Safe Bonds and Found Illusion". The New York Times. สืบค้นเมื่อ November 11, 2011. ↑ "Greece: Foreign Capital Inflows Up « Embassy of Greece in Poland Press & Communication Office". Greeceinfo.wordpress.com. 17 September 2009. สืบค้นเมื่อ 5 May 2010. ↑ Floudas, Demetrius A. "The Greek Financial Crisis 2010: Chimerae and Pandaemonium". Hughes Hall Seminar Series, March 2010: University of Cambridge. ↑ "Back down to earth with a bang". Kathimerini (English Edition). 3 March 2010. สืบค้นเมื่อ 12 May 2010. ↑ "Rehn: No other state will need a bail-out – EU Observer". สืบค้นเมื่อ 6 May 2010. ↑ "Greece Paid Goldman $300 Million To Help It Hide Its Ballooning Debts – Business Insider". สืบค้นเมื่อ 6 May 2010. ↑ Story, Louise; Thomas Jr, Landon; Schwartz, Nelson D. (14 February 2010). "Wall St. Helped to Mask Debt Fueling Europe's Crisis". The New York Times. สืบค้นเมื่อ 6 May 2010. ↑ "Greek Deficit Revised to 13.6%; Moody's Cuts Rating (Update2) – Bloomberg.com". สืบค้นเมื่อ 2 May 2010. ↑ "Britain's deficit third worst in the world, table – Telegraph". The Daily Telegraph. London. 19 February 2010. สืบค้นเมื่อ 2 May 2010. ↑ "Greek Debt Concerns Dominate – Who Will Be Next? – Seeking Alpha". สืบค้นเมื่อ 2 May 2010. ↑ 69.0 69.1 Ewing, Jack (27 April 2010). "Cuts to Debt Rating Stir Anxiety in Europe". The New York Times. ↑ "BBC News – Greek credit status downgraded to 'junk'". 27 April 2010. สืบค้นเมื่อ 2 May 2010. ↑ "Markets hit by Greece junk rating". BBC News. 27 April 2010. ↑ "ECB: Long-term interest rates". สืบค้นเมื่อ 2 May 2010. ↑ Ingrid Melander (5 March 2010). "Greek parliament passes austerity bill". Reuters. สืบค้นเมื่อ 6 May 2010. ↑ "Greece seeks activation of €45 billion aid package". Irish Times. 23 April 2010. สืบค้นเมื่อ 6 May 2010. ↑ "Greek minister says IMF debt talks are 'going well'". BBC. 25 April 2010. สืบค้นเมื่อ 6 May 2010. ↑ Christos Ziotis and Natalie Weeks (20 April 2010). "Greek Bailout Talks Could Take Three Weeks; Bond Payment Looms". Bloomberg. สืบค้นเมื่อ 6 May 2010. ↑ Steven Erlanger (24 March 2010). "Europe Looks at the I.M.F. With Unease as Greece Struggles". The New York Times. สืบค้นเมื่อ 6 May 2010. ↑ Gabi Thesing and Flavia Krause-Jackson (3 May 2010). "Greece Gets $146 Billion Rescue in EU, IMF Package". Bloomberg. สืบค้นเมื่อ 6 May 2010. ↑ Kerin Hope (2 May 2010). "EU puts positive spin on Greek rescue". Financial Times. สืบค้นเมื่อ 6 May 2010. ↑ 82.0 82.1 Friedman, Thomas L. (14 May 2010). "Greece's newest odyssey". San Diego, California: San Diego Union-Tribune. pp. B6. ↑ Judy Dempsey (5 May 2010). "Three Reported Killed in Greek Protests". The New York Times. สืบค้นเมื่อ 5 May 2010. ↑ "'De-facto' Greek default 80% sure: Global Insight – MarketWatch". MarketWatch. 28 April 2010. สืบค้นเมื่อ 2 May 2010. ↑ "cnbc: countries probable to default". CNBC. 1 March 2010. ↑ "Greece Turning Viral Sparks Search for EU Solutions (Update2) – Bloomberg.com". Bloomberg. 29 April 2010. สืบค้นเมื่อ 2 May 2010. ↑ "Roubini on Greece , Analysis & Opinion ,". Blogs.reuters.com. 27 April 2010. สืบค้นเมื่อ 5 May 2010. ↑ Frierson, Burton (14 January 2010). "Fed's balance sheet liabilities hit record". Reuters. ↑ "BBC News – Q&A: Greece's economic woes". BBC. 30 April 2010. สืบค้นเมื่อ 2 May 2010. ↑ "Italy Not Among Most at Risk in Crisis, Moody's Says (Update1)". Bloomberg. 7 May 2010. สืบค้นเมื่อ 10 May 2010. ↑ "Finfacts Ireland Missing Page". Finfacts.ie. สืบค้นเมื่อ 15 April 2011. ↑ Murado, Miguel-Anxo (1 May 2010). "Repeat with us: Spain is not Greece". The Guardian. London. ↑ Abigail Moses (26 April 2010). "Greek Contagion Concern Spurs Sovereign Default Risk to Record". Bloomberg. สืบค้นเมื่อ 30 April 2010. ↑ "/ Reports – Sovereigns: Debt levels raise fears of further downgrades". Financial Times. 24 February 2010. สืบค้นเมื่อ 5 May 2010. หน้านี้แก้ไขล่าสุดเมื่อวันที่ 27 กรกฎาคม 2558 เวลา 10:12 น.